I can only assume that when Anderson penned those words of wisdom, he hadn’t been traveling around the world for 20+ months. One of the realities of being a long-term traveler means you rarely travel the fastest or easiest way to your destination, because fast & easy usually don’t come cheap. When every dollar saved can potentially mean another day on the road, you learn to trim the financial fat and only drain money from your perpetually dwindling travel fun for absolute necessities. This means choosing 14-hour bus rides over 30-minute plane rides, settling for a third-class train ticket, and letting the breeze from an open window cool you (or not) rather than splurging for A/C. Maybe your seat mate will be a chicken and your footrest will be a crate of tomatoes. When taking a plane is unavoidable, cost is prioritized above all else, meaning you tend to fly a budget airline with awkward layovers at inhumane hours. Were you on a vacation, you’d happily shell out the extra $150 per ticket for something a little more civilized, but… this isn’t a vacation: this is the reality traveling for months on end. It’s for this reason that most long-term travelers swiftly come to lament actual travel days and focus on the destinations instead; the task of actually getting from one place to another is usually too laborious and exhausting to incite many of us to dwell on or relish the process. Tony & I are no strangers to marathon travel days: It’s a 13-hour drive—minimum—from Nashville to either of our parents’ homes and, plane tickets costing what they do in North America, it’s a journey we’ve each undertaken more times than we care to count. So it’s really no surprise that we’ve faced down more than our fair share of beastly travel days during our otherwise leisurely jaunt around the world. 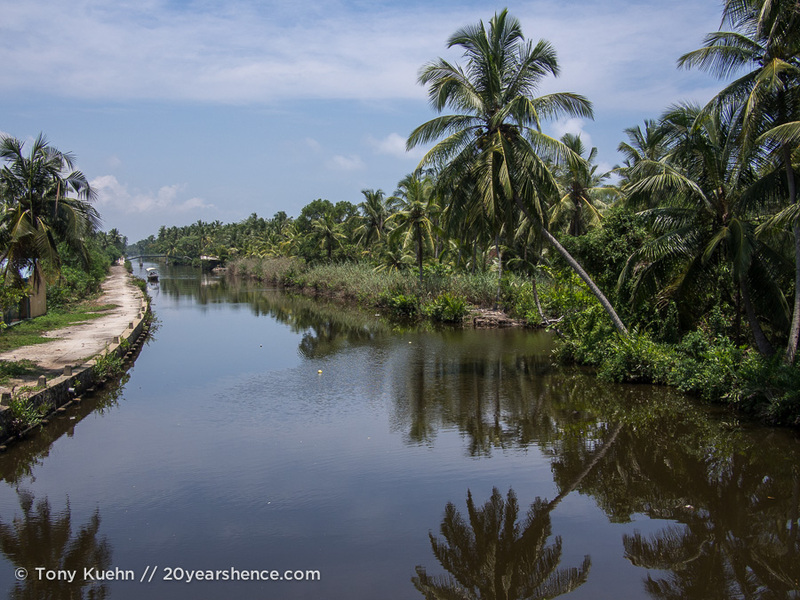 From vomit vans to multi-day boat trips, we’ve braved them all… and yet, our journey from Bangkok, Thailand to Ambalangoda, Sri Lanka just might take the cake for the most epic of them all clocking in at just under 24 hours. 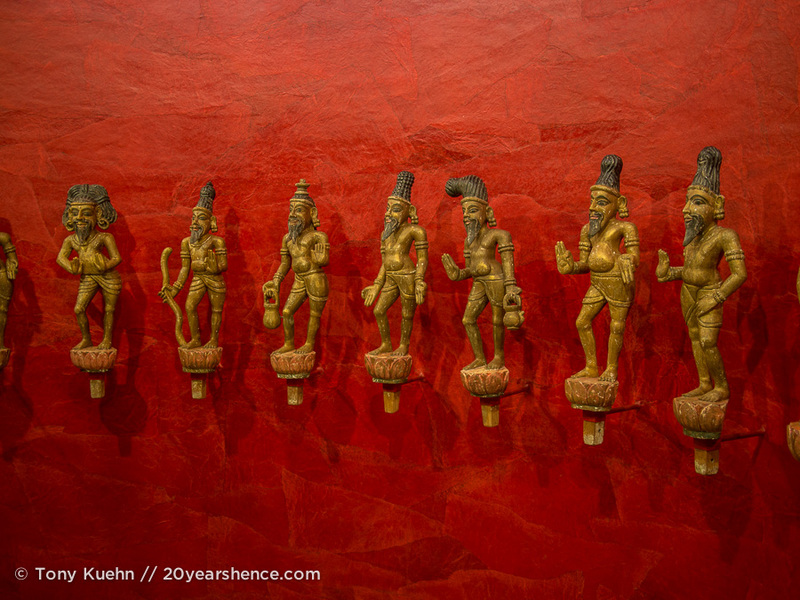 It all begins when we decide to book a red-eye flight out of Bangkok. It departs at 9 pm, connects in Mumbai at 2:30 am, and lands in Colombo at the not-so-ripe hour of 5 am. Of course there are other flight options, but tickets are $100 cheaper each for this one, so we resign ourselves to an essentially sleepless night. 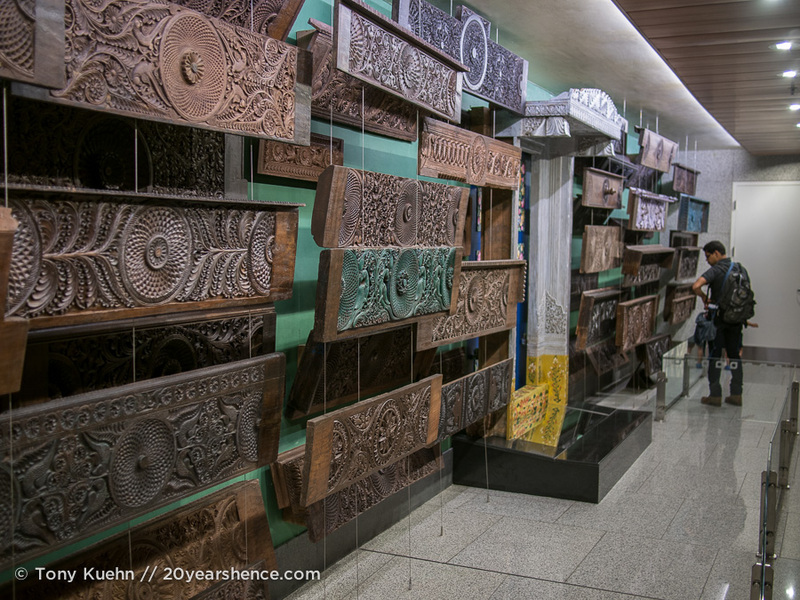 As excited as we are to finally be visiting Sri Lanka, it is with heavy hearts that we make our way to Suvarnabhumi airport in Bangkok… and not just because of our less than ideal itinerary. As I’ve said before, Thailand is a country we never anticipated falling in love with but it swiftly ensorcelled us and we found ourselves returning to it again and again during our time in Asia. Saying goodbye to it this time, knowing it is the last time for the foreseeable future, is beyond difficult. When you travel as long as we have, you come to realize how precious it is to find places that truly feel like home; perhaps more than anywhere else on this journey, Thailand has been that for us. Adding insult to injury, we have to reconcile ourselves to our last meal in the country being crappy (and horrifically overpriced) airport food. Happily, apart from our ignoble last supper, the flight portion of our journey goes better than expected: not only do I manage to catch a bit of shut eye AND get to indulge in multiple yummy inflight Indian meals but, shocker of all shockers, the Mumbai airport turns out to be super fancy and nice. Like, “wandering through a museum/art gallery” kind of nice. Who knew? We still wander out of the Colombo airport—the sun still asleep and the morning air surprisingly cool—feeling far from fresh-faced. Within minutes of leaving the airport grounds, a thick hush blankets the world, punctuated intermittently by the bright trills of birds singing to herald a new day and the occasional growl of a tuk tuk engine. 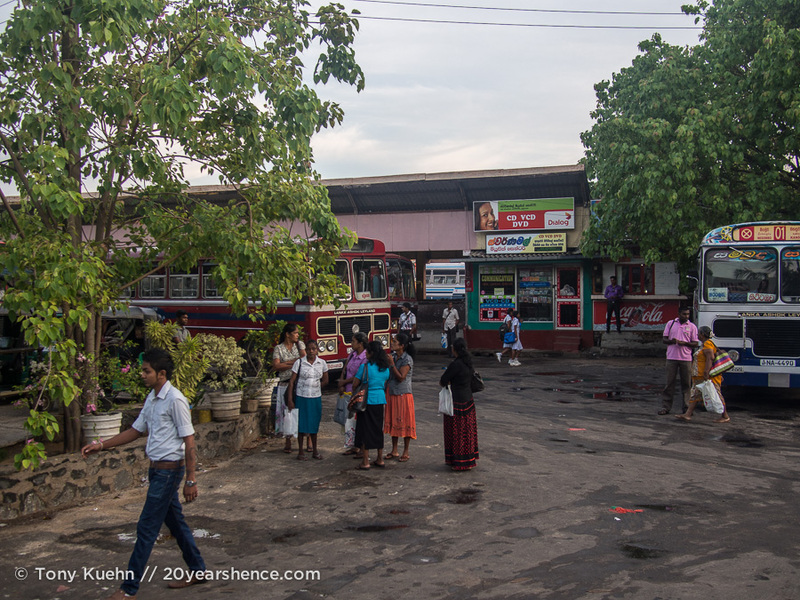 Although our first stop of the day is the nearby city of Negombo, our early arrival means we are in no rush and so we decide to forgo the convenient-but-pricy taxi drivers hanging around the airport and instead hoof it to the public bus depot 1 km away. 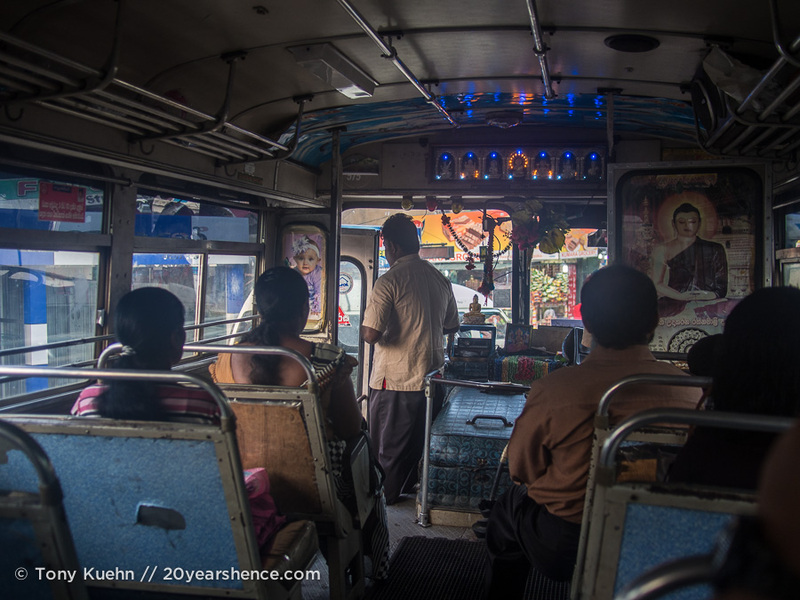 I’m glad we aren’t in a hurry because traveling to a city located no more than 10 km away winds up taking about two hours, and even requires jangling along in not one but two old school buses that have been given a second lease on life here in Sri Lanka. Adorned with Buddha icons lined with psychedelic lights that blink and flicker hypnotically whenever the driver touches his brakes, there is something inherently charming about the south Asian makeover they have received. 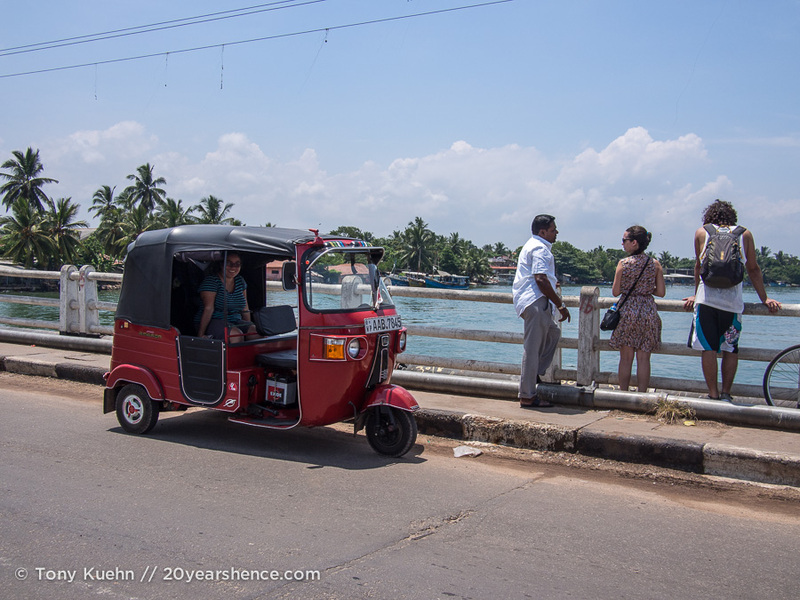 Arriving in Negombo proper, tuk tuk drivers swarm us like bees at a hive, but we remain resolute about having alternate transport arranged. 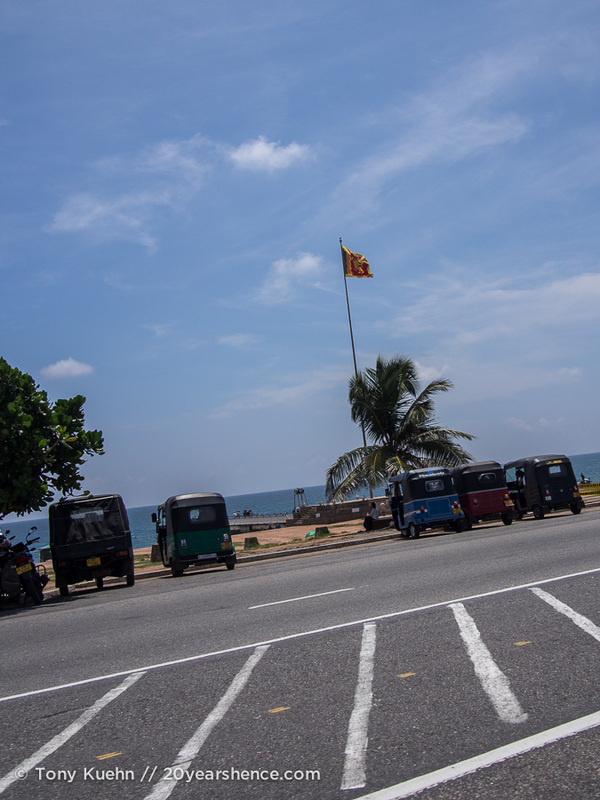 In fact, the reason we have traveled to Negombo in the first place is to pick up a tuk tuk of our very own that we plan to drive around the country. A crazy plan, perhaps, but once we got it into our heads while planning our Sri Lanka itinerary, we just knew there was no other way we’d rather tour the country. A “five-minute” wait for the owner of the tuk tuk rental office turns into one verging on 90 minutes, but eventually our fire-engine red steed is delivered. Almost immediately, we name our ride King Tuk and are directed to the beach for a crash course (though thankfully not literally!) in tuk tuk handling. After about five minues of driving in increasingly confident circles, Tony is driving on actual streets with actual traffic! Only when we are getting ready to depart Negombo and head south does disaster well and truly strike: a tuk tuk driver idling nearby remarks that he can smell gasoline. Sure enough, when we check under the tuk tuk, we see it is dripping fuel all over the pavement. Some problem with the fuel line is identified but as it is being fixed, I begin to wonder whether this isn’t an omen that we should just cut our losses and stick to buses and trains as a means of exploring. I worry that if the tuk tuk is already requiring repairs and we haven’t even officially started our adventure, surely this does not bode well for the next three weeks. I know a finicky motorcycle is something we can deal with, but tuk tuk maintenance seems a fair bit more laborious (and therefore, potentially more expensive) and I fear we have bitten off more than we can chew. In the end, the tuk tuk is fixed and we decide to see our crazy dream through and agree we will try to see as much of Sri Lanka from this little tin can on wheels as we can. We are about 2.5 hours later leaving Negombo than I anticipate, but our final destination of the day is Ambalangoda, an overlooked town nestled along the southwest coast of the country, approximately 140 km from where we are starting. I am confident we can be there in three or four hours, tops. Only, I completely fail to account for just how incredibly beautiful Sri Lanka is. 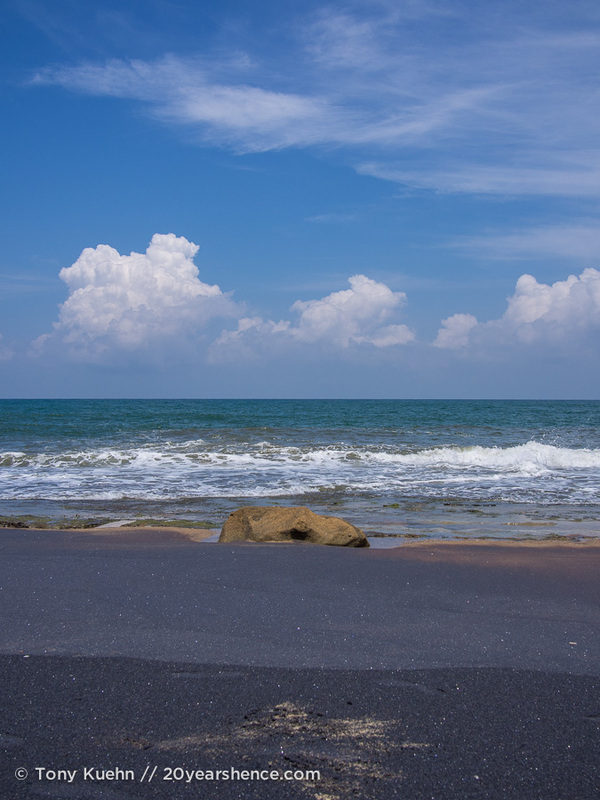 We are driving along a coastal road and see something every hundred meters or so that makes us say “Wooooooow.” We can’t resist darting into tiny alleyways so that we can take impromptu photo shoots on the beach and admire the view, reveling in the thunderous crash of the rolling surf. We get into a rhythm where we drive for five minutes and then stop to gawk and take photos for five. It’s great for exploring, but terrible for covering large distances. Still, we can’t help but sacrifice southward for the opportunity to luxuriate in the beauty that surrounds us. We are lucky to have visited many an island paradise on this journey (we spent two months in the Philippines, remember? ), but within an hour, Sri Lanka has me convinced that it just might be the prettiest of them all. 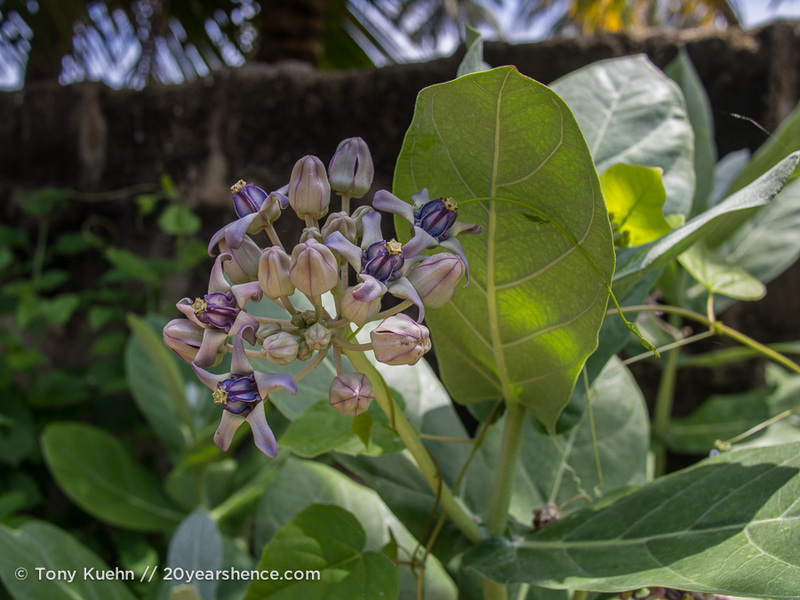 There are flowers everywhere we look, all in bright and exotic hues that should be filed under “paradise” on the color wheel. The beaches are pristine and look like they have been ripped straight from a postcard: flawless sandy expanses, vivid blue water, lazy palm trees for shade and only the occasional fisherman dotted here and there to break up the otherwise uninterrupted solitude. 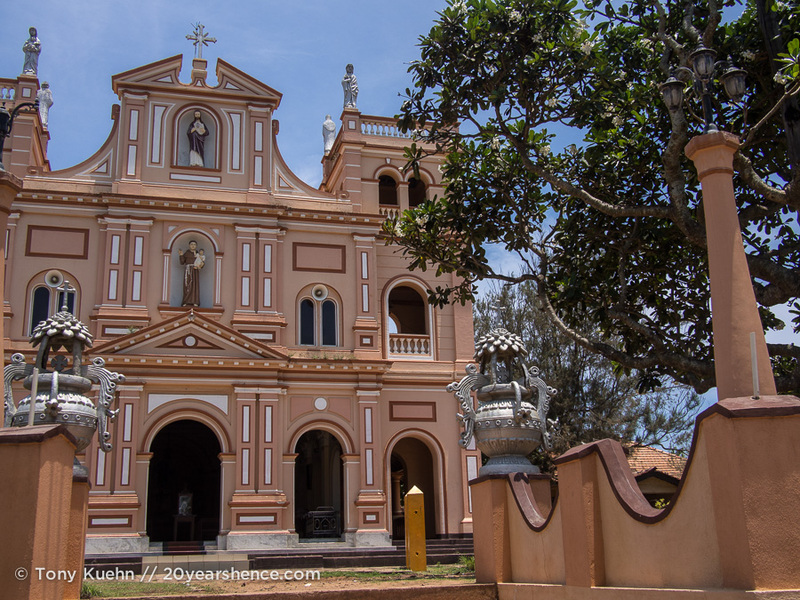 Every so often we pass seemingly incongruous Catholic churches painted in bright pastel shades that exude an appealing mishmash of old world colonial influences wed with island vibrancy. With each mile we gain as we putter south, a knot of fear inside me slowly begins to loosen and relax. I have wanted to visit Sri Lanka for so long that part of me had become convinced that my desire would pre-emptively jinx this visit leaving me disappointed by unrealistic expectation. As I gaze out of the tuk tuk as one beautiful view transitions into another, I am reminded that sometimes we get lucky and dreams really do come true. If we have to be in transit for nearly an entire day, I can hardly think of any other place where doing so is not only such a pleasure, but truly justifies the exertion. Gradually the beaches and quiet serenity of the Sri Lankan countryside begin to fade as we find ourselves gliding into the country’s capital city, Colombo. At this point, it is midday and the air shimmers from the heat of the hour. As Tony wends his way through our next impediment—Colombo traffic—my eyes get heavy and I fight to keep myself from slipping off to sleep, lulled by the warmth and the many hours we have already spent on the road. I am too drowsy to take many pictures (and truthfully, the traffic is too chaotic and unpredictable to get many good shots when I try), but I see a city that reminds me an awful lot of Kuala Lumpur, filled as it is with a mishmash of architectural styles and an omnipresent hubbub. It is, I think, a city I would probably find very interesting to explore… but as we inch along in bumper-to-bumper traffic, I am not so sure I’d have the patience for it! Our time in Colombo is mired not only by traffic congestion but also by the death of our cellphone battery. The GPS burns through the charge and we have been relying on it to navigate us through Sri Lanka’s back roads. As the phone begins to chirp calls of distress signaling low battery, we decide to find a shop that sells car chargers so we can use it while on the go in the tuk tuk. 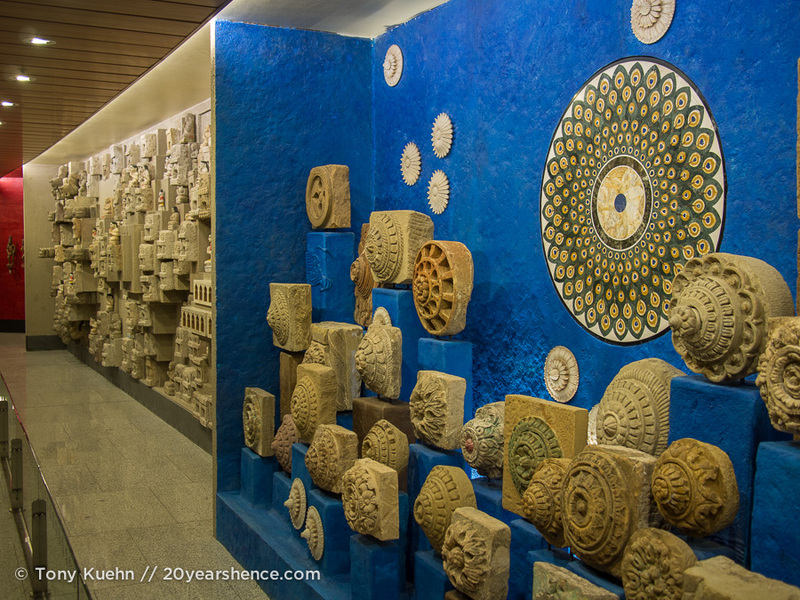 A seemingly simple task, we have no idea where to look and we wind up on wild goose chase where we visit no fewer than five different shops and get lost in the labyrinth of streets that form Colombo’s downtown core during the course of our hunt. When we finally find a shop specializing in phone accessories, I am so relieved that I don’t even bother to haggle, but simply hand over the vendor’s asking price. Creeping and crawling along at a snail’s pace, we lose about three hours in Colombo to traffic and elusive cell phone chargers. When we are finally back out on the open road, the Sri Lankan countryside seems all the more beautiful for it. It’s hard to believe a place so lovely and picturesque, the epitome of tropical splendor, actually exists in this world. We chug our way through little non-descript villages, trying our best to follow the directions our homestay host has provided us. 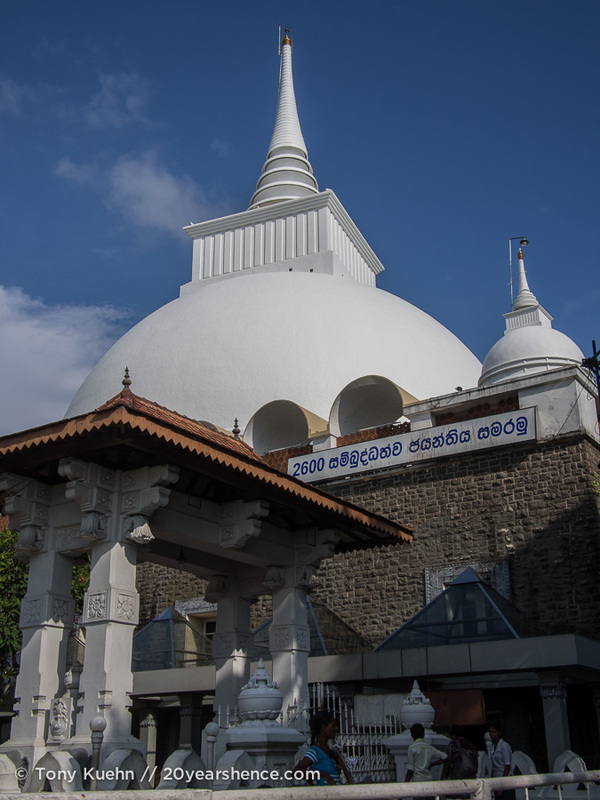 When we believe we have arrived in Ambalangoda, I phone to say that we have just passed a large white dagoba and have spotted the train station and a clock tower but we need slightly more precise directions. Some confused back-and-forth ultimately gives way to reveal that rather than being in Ambalangoda as we think, we are still, in fact, about 60 km north of the village. And so we drive, hardly a hardship with the natural beauty that surrounds us, though a bit more tiring now that we have been in and out of the tuk tuk for about six hours. You wouldn’t think that there would be much for us to get up to in just 60 km, but in that time we still manage to: stop at multiple beaches, get pulled over by police for a cooked up traffic infraction that we wind up having to pay a 500LAK (~$4US) bribe to escape, and make time for a tour of an incredibly ornate and ostentatious Buddhist temple (capped off with the monk demanding a exceedingly generous tip for temple upkeep and his services as guide afterwards which we firmly demurred). I daresay those final two hours of the journey were perhaps the most momentous of all. Just as the sun begins to drop and dip in the sky, and drops of rain begin to fall, we finally make it to Ambalangoda. After a few more harried phone calls to our hosts to confirm locations, we turn down a little brick lane and see what is possibly the best view that a traveler on the road for 24 hours can ever hope to see: home. On days such as this one, it’s easy to get caught up in the journey, and see the beauty it can hold. But it’s also journeys like these, long and not without potholes in the road, that make arriving at one’s destination all the sweeter as well. 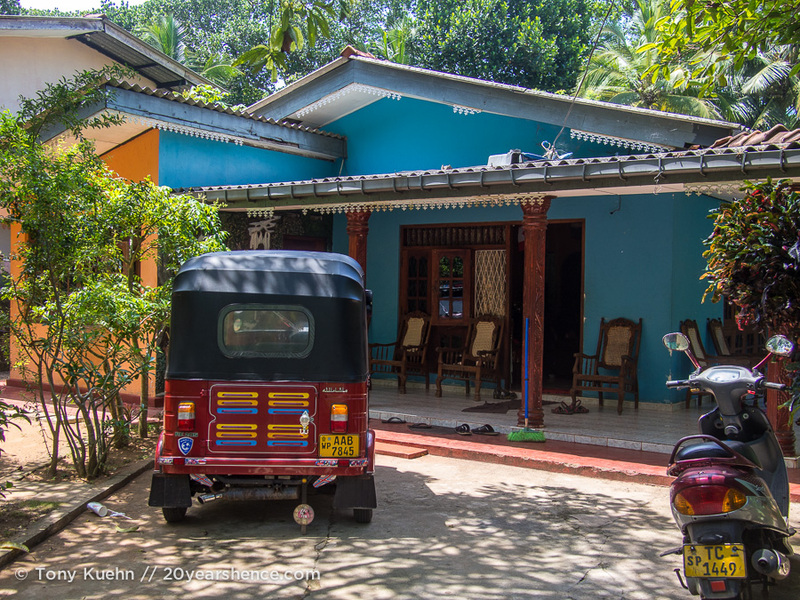 It may have taken us nearly an entire day to truly arrive in Sri Lanka, but as we stepped from King Tuk and stretched our legs as our host family gathered round, we knew there was no place else we would rather be. 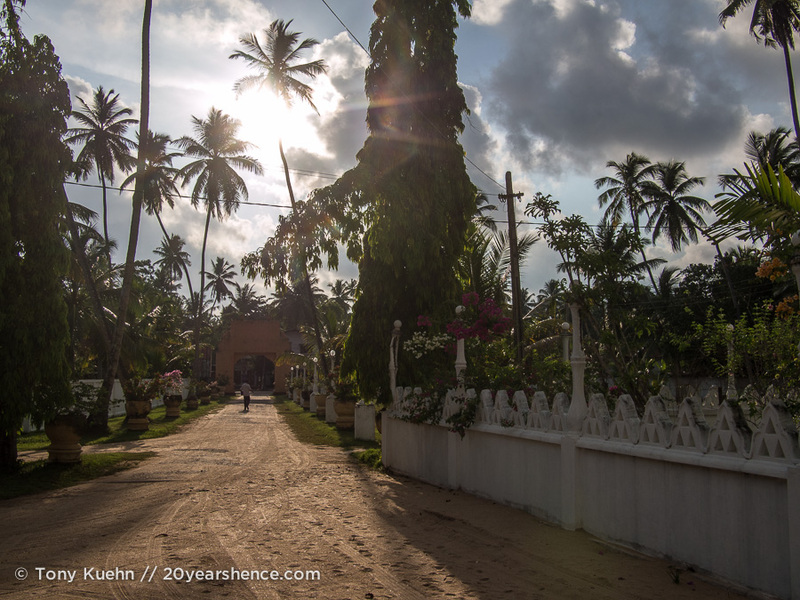 Tell Us: Does Sri Lanka look like paradise to you? What has been your most epic travel day? My most epic travel day was flying to Tajikistan. Overnight flight from Hong Kong to Istanbul, 12 hours transit (which I used sightseeing), then about 4 hours flight to Dushanbe. Then straight into a jeep for a 16 hour ride to Khorog. I didn't make it – about two hours out of Khorog, and in the dead of the night, I begged the driver to drop me at a local hotel, where I slept the sleep of the dead!! 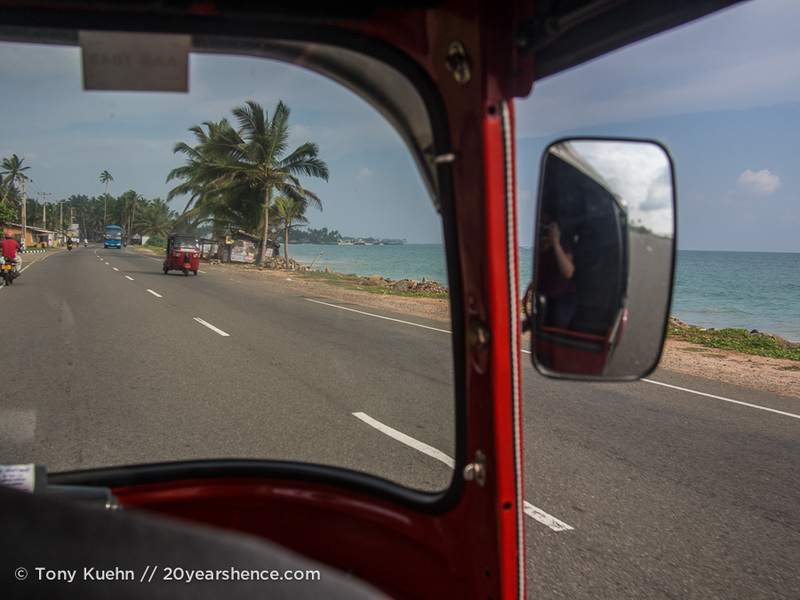 Trust us: when in Sri Lanka, travel by tuk tuk… it’s the BEST way to see the country! WOW! Check out those photos! That all looks so beautiful! No wonder it took you so long to get to your homestay, I would have stopped everywhere too! 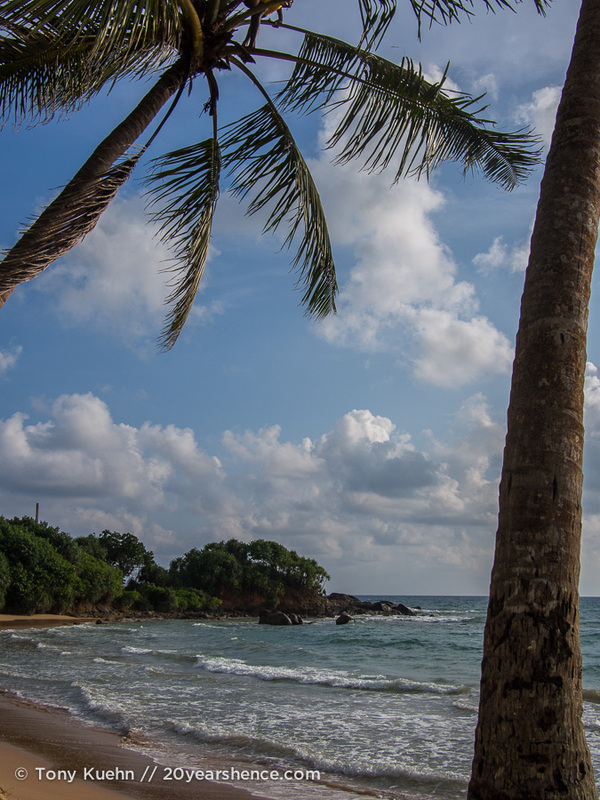 Sri Lanka does look like paradise – we’ve never really thought about visiting but I’m now thinking it would be a good idea to go there when we’re next in Asia. 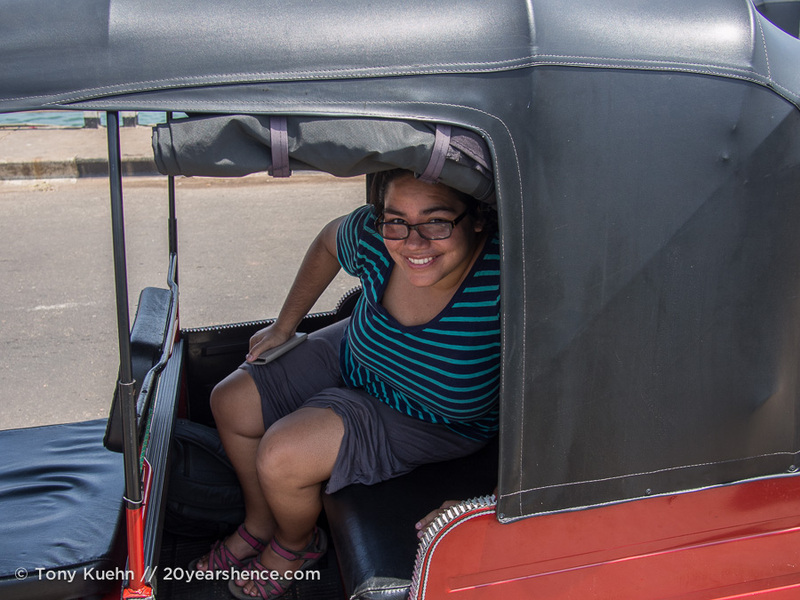 I think driving your own Tuk Tuk around was an awesome idea! We have had our share of horrific travel days too but our overnight bus trip from Hoi An to Mui Ne in Vietnam and our 13-hr bus ride across Laos were particularly bad. I now appreciate how small and easy to get around the UK is! Oh, Amy, you guys should DEFINITELY plan to visit Sri Lanka. It is right up there near the top of my list of favourite places we have visited in our travels. Think the beauty of the Philippines (both the landscape and the people) and add in incredible food (and vegetarian is really easy to find) at dirt cheap prices. I’m actually surprised more people don’t visit this paradise! It looks gorgeous! I am trying to decide whether to cut down the time I have planned for India to visit Sri Lanka – at the moment I am leaning towards spedning 3 weeks in Sri Lanka, 3-4 weeks in Nepal and 2 – 2/12 months in India but will see how it unfolds when I am travelling. My longest travel day was 36 hours of planes and stopovers from London to New Zealand with no sleep – urgh! Having not visited India on this trip (one day! ), I can’t say whether you should plan to cut your time there short, but I will say that we really enjoyed our time in Nepal (we spent nearly 3 months there!) and we really adored Sri Lanka. And surprisingly (to me, at least), the culture and vibe between Sri Lanka & Nepal could not have been more dissimilar (I expected them to be fairly alike) so I would imagine you would not find a visit to all three redundant in the least. I dream of visiting India one day—it looks & sounds incredible—but I have to say, I’m so glad I visited Nepal & Sri Lanka and would love to return to both. If you can visit all three, I say do it! Beautiful! As exhausting as that trip sounds, those are always some of my favorite moments from trips…and usually where my best stories come from. Granted, I haven’t traveled the way you guys have, but if this post is indicative of the journey, then I think it’s one you’ll remember for a long time to come. Spelling the name of this place would be a big problem for me! 🙂 But I can see it offers a lot of great things! I absolutely agree with tuk tuk transport being the best one! It’s comfy and so affordable! Don’t worry, I had problems not just spelling this name, but pronouncing it too whenever people asked us where we were going. 🙂 Definitely worth the hassle, though! I saw the pictures of you two on the tuk-tuk before and kept wondering if you managed to wrangle one and drive it around yourselves. What a great idea! Gives you the breeze and freedom of a motorbike but with the added comfort of shade – best of all worlds, it seems. A rickshaw driver in Jaipur offered to let me try his out, but I balked given the traffic and since it was at night – wish I had just gone for it in hindsight. Those pictures are downright incredible. Just…..damn. Damn! Our travel plans right now are in flux after Cambodia and Vietnam and this post may make the decision just a wee bit more complicated. Now just to convince Anais I’ll be able to handle a tuk-tuk…. 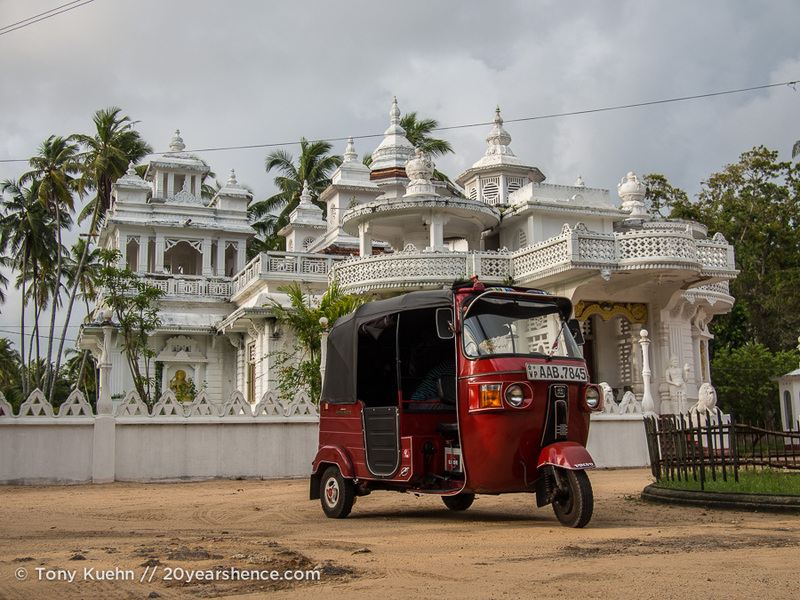 Tony will be writing a guide/post detailing the ins & outs of renting & driving a tuk tuk in Sri Lanka, so definitely keep your eyes peeled for that one. 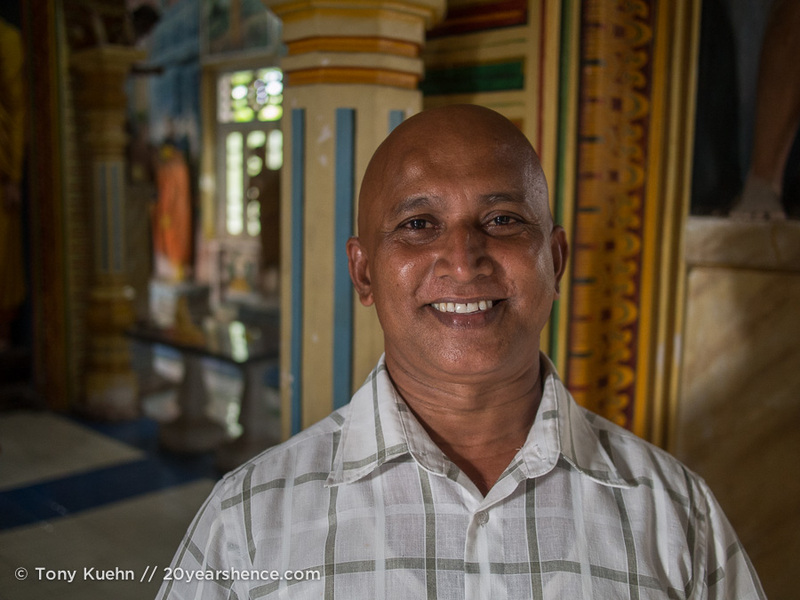 It’s definitely not an opportunity you get every day, and we’re so glad we took it—especially since Sri Lanka can get quite rainy… more than once we were so happy to have a roof over our heads as we were rambling about from place to place! 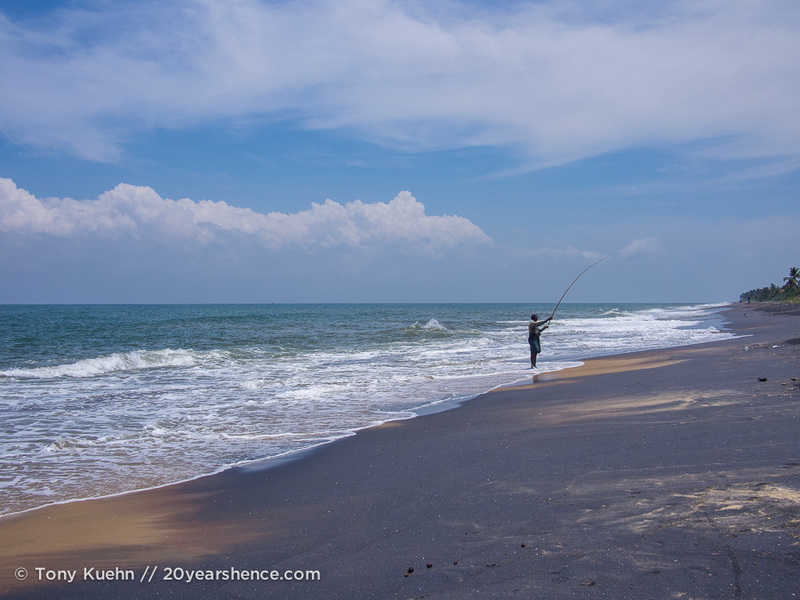 I know it’s so so hard to figure out where to go next when you’ve got the entire world available to you and Sri Lanka is not really the most convenient destination in all likelihood, but we highly recommend it. It was one of our favorites! I love how you named it King Tuk! Haha! That’s amazing that you rented your own and drove it all around! I would definitely be stopping every five minutes for photos, too. It looks like such an incredible country! 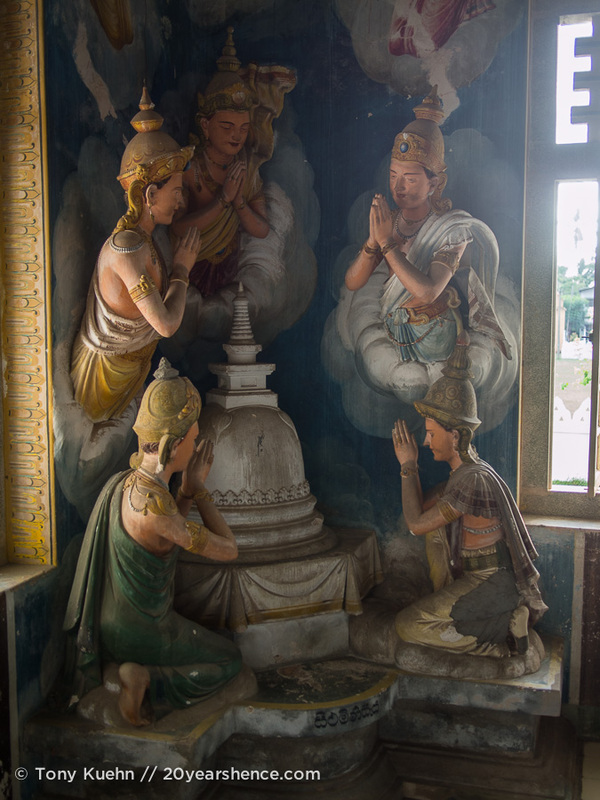 King Tuk’s name was pretty much unanimously decided immediately upon meeting “him” for the first time. When you know, you just know, and he was one heck of a ride! I think it would be hard for us to return to Sri Lanka and see the country any other way. My goodness – that is a crazy long travel time and you guys are machines doing it on so little sleep! We had a 23 hour travel day from an island off Belize back to Canada and I swore never again until this year. You are totally right: we tend to look forward to the destination since budget isn’t always the most direct! I think what made this day particularly challenging is that for the bulk of it, we were 100% in charge of the travel… so we had to get to the bus station and then figure out what bus we needed to take and then transfer, and then we had the tuk tuk and Tony had to drive it all the way to Ambalangoda. There was no opportunity to catch a cat nap (for him! I totally slept in the back of the tuk tuk…) and recharge as you might on a plane or a bus, but instead you have to be alert and in control. I guess it’s good that we took so many epic roadtrips back in the day; they were good training! What an epic adventure! 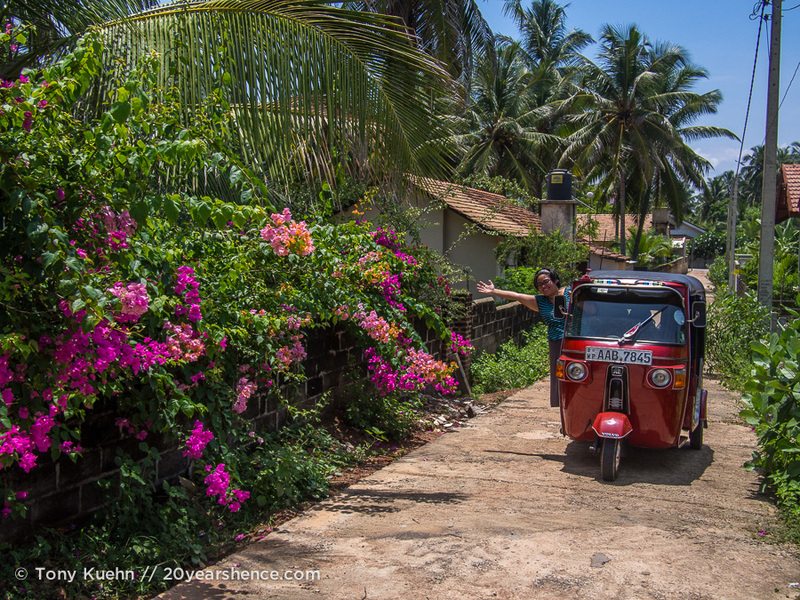 Renting a tuk-tuk was a stroke of genius! It’s something I never would have thought of, but love the freedom it entailed. I’ve often lamented from inside a bus that I couldn’t get out and savor the scenery. Even on road trips in cars, it’s hard to stop and pull over when you’re traveling at such high speeds. 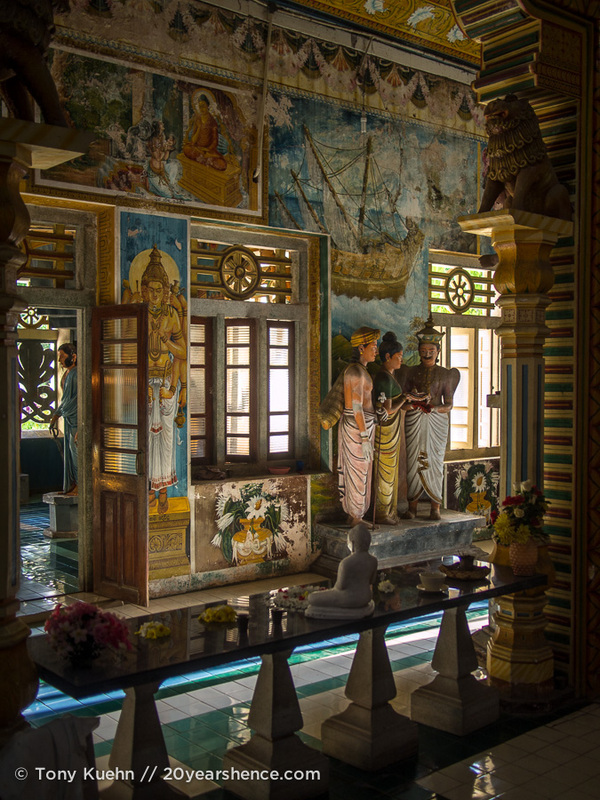 And these gorgeous photos have just earned Sri Lanka a spot on our itinerary the next time we’re in Asia. Wow! 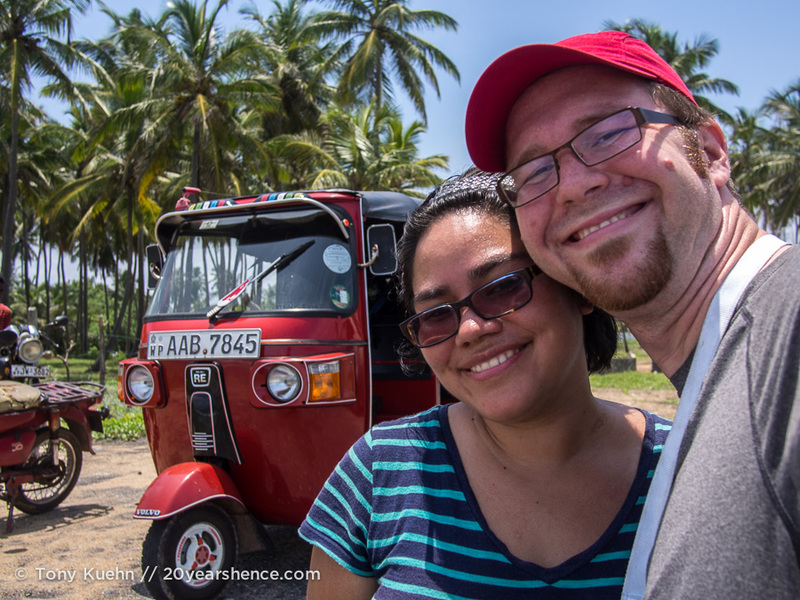 We were initially planning on renting a motorcycle for our adventure, but a tuk tuk was WAY better (except in Colombo where traffic is so bad that a nimble motorbike would be nice). It made transporting our bags a breeze and, when it rained, which happened frequently, we didn’t have to worry! You DEFINITELY must go to SL when you’re next in Asia. It’s one of the most stunning countries we’ve ever visited. I am in Sri Lanka right now and I agree that it is just a beautiful country. I am so happy to be here! We are in Tangalle right now, we flew into Hambantota from Bangkok rather than Colombo as you did. I am so jealous of your idea to travel in a Tuk Tuk! It is an epic idea! Was it difficult to arrange? We are going to Ella tomorrow and then Kandy the next day to catch the final night of the Esala Perahera. Do you plan to go? It looks amazing I can’t wait to see it. We might be heading to Colombi after so maybe we will steal your amazing idea and look into a Tuk Tuk for the remainder if our trip!